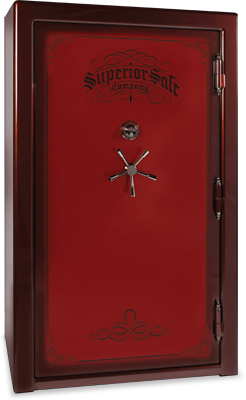 The Supreme Series safes are truly the ideal in safe production, containing more steel than any other safe in the industry. Their unparalleled structure includes a Triple-Step™ door with three heat-expanding seals, four layers of fire protection, and a glass relock system. Finally, the unsurpassable radius, door edges and luxurious standard of two-tone finishes set them apart as the ultimate safe. S-55 46"×73"×27½" 3⁄16" 30" 55 CF 1725 lbs 18–11⁄2" 1⁄2" 23⁄4"
3⁄16" 30" 45 CF 1550 lbs 18–11⁄2" 1⁄2" 23⁄4"
S-35 34"×67"×25½" 3⁄16" 28" 35 CF 1250 lbs 16–11⁄2" 1⁄2" 23⁄4"